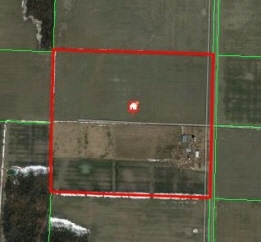 103.44 acres cash crop with 95 workable. Older yardsite (former cattle facility) and residence (approx. 31 years old). Seller would entertain long-term lease on residence or if possible, sever and keep residence. Good yield with 44 bushel average beans. Stone free. Municipal water, gas and hydro. Another 104.99 acres available adjoining at 1065 Dawn Valley Rd. $783,000. Opportunity for a 208+/- acre block.